The floor display product type of the POP display market has been long in demand and is expected to dominate the product segment over the forecast period. Factors such as increase in the trade and evolution of organized retailing are seen as crucial in influencing market growth trends. However, the POP display market still faces challenges from online shopping. Online shopping offers benefits such as time saving, convenience, payment tracking, etc. Advancement in the POP display products in terms of recyclable materials are likely to offer significant opportunities to the market in various applications such as food and beverage, cosmetics & personal care, pharmaceuticals, and others. Attracted by this fast expanding market and underlying latent demand, many players are investing in the POP display market. In July 2018, Smurfit Kappa Group acquired Reparenco, a Netherlands based company for US$ 533.4 million. This acquisition is aimed to strengthen the business model of the company and add around 405,000 tons of recycled containerboard capacity to the company's system. Some of the prominent players operating in the POP display market and profiled in the study include International Paper Company, DS Smith Plc, Smurfit Kappa Group PLC, Sonoco Products Company, Menasha Packaging Company, LLC., Georgia-Pacific LLC, WestRock Company, Pratt Industries Inc., Marketing Alliance Group, and FFR Merchandising Company. 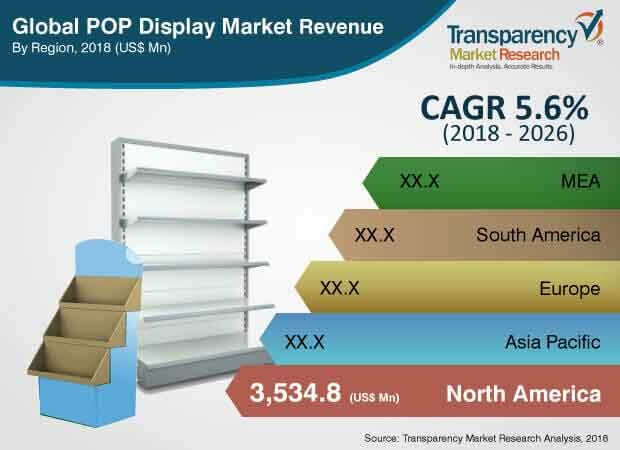 This comprehensive report by Transparency Market Research analyzes and forecasts the POP display market at the global and regional level. The report provides analysis over the period 2016–2026, wherein 2018 to 2026 is the forecast period and the base year is 2017. An in-depth and unbiased market assessment has been made to offer readers in-depth and accurate analysis. The report emphasizes all the major trends and services playing a key role in the growth of the POP display market during the forecast year 2018to 2026. It also focuses on market drivers, restraining factors, and opportunities of the POP display market during the said period. The study provides a complete perspective on the market’s growth throughout the research study in terms of value and volume (US$ Million & Million Units) across various geographies, including Asia Pacific, South America, North America, Middle East & Africa (MEA), and Europe. The report includes a detailed value chain analysis, which provides an extensive view of the global POP display market. Porter’s Five Forces analysis has also been provided to understand the competitive scenario and other forces and their impact on the market. The study incorporates a market attractiveness analysis, wherein the market segments based on product type, material type, sales channel, and application are benchmarked based on their market size, growth rate, and attractiveness in terms of opportunity. In order to provide a complete analysis of the overall competitive scenario in the POP display market, every geographic region mentioned in the report is provided with an attractiveness analysis. A market overview chapter in the report explains the market trends and dynamics, which include the drivers, restraining factors, and opportunities for the current and future POP display market. A global market outlook analysis has also been provided in the report. Additionally, the report provides analysis of different business strategies adopted by leaders in the POP display market. The market introduction chapter helps in gaining an idea of different trends and services related to POP displays along with their product type, material type, sales channel, and application. The study provides a decisive view on the global POP display market by segmenting the market based on product type into counter display, floor display, gravity feed, pallet display, side kick display, dump bin display, clip strip, and other pop display. In terms of material type, the market has been classified into corrugated board, foam board, plastic sheet, glass, and metal. Based on sales channel, the POP display market has been segmented into hypermarket & supermarket, departmental store, specialty store, convenience store, and others. In terms of application, the POP display market has been categorized into food & beverages, cosmetics & personal care, pharmaceuticals, printing & stationary, electronics, automotive, and others. The report provides a detailed region-wise break down of the POP display market and categorizes it at various levels, thus providing valuable insights at the micro and macro levels. The report highlights the competitive scenario within the POP display market, ranking all the major players according to key recent developments and their geographic presence. The insights on the POP display market are a result of our extensive primary interviews, secondary research, and in-house expert panel reviews. These market estimates have been analyzed by considering the impact of different economic, political, social, legal, and technological factors. The market in North America is bifurcated into the U.S., Canada and the Rest of North America. Furthermore, the market in Europe is analyzed across Germany, Spain, Italy, France, U.K., Benelux, Russia, and the Rest of Europe. The POP display market in Asia Pacific has been analyzed across China, India, Japan, ASEAN, Australia & New Zealand, and Rest of Asia Pacific. Middle East &Africa covers North Africa, South Africa, G.C.C. countries, and the Rest of Middle East & Africa. Similarly, South America includes Brazil, Argentina, and the Rest of South America. The report provides all the strategic information and insights required to understand the POP display market along with its product type, material type, sales channel, and applications according to the various geographical regions mentioned above. The research methodology is a perfect combination of primary research, secondary research, and expert panel reviews. Secondary sources such as annual reports, company websites, SEC filings and investor presentations, national government documents, internal and external proprietary databases, statistical databases, relevant patent and regulatory databases, market reports, government publications, World Bank database, and industry white papers are usually referred to. Primary research involves telephonic interviews, e-mail interactions, and face-to-face interviews for detailed and unbiased reviews on the linear market, across geographies. Primary interviews are usually conducted on an ongoing basis with industry experts and participants in order to get the latest market insights and validate the existing data and analysis. Primary interviews offer new and fresh information on important factors such as market trends, market size, competitive landscape, growth trends, etc. These factors help to validate and strengthen secondary research findings. Moreover, the data collected and analyzed from secondary and primary research is again discussed and examined by our expert panel. The research study includes profiles of leading companies operating in the global POP display market. Market players have been profiled in terms of attributes such as company overview, financial overview, business strategies, and recent developments. Parameters such as investment & research and developments by major players of the market are tracked. Some of the key players in the POP display market are Menasha Packaging Company, LLC., Georgia-Pacific LLC, Pratt Industries Inc., FFR Merchandising Company, Marketing Alliance Group, Sonoco Products Company, DS Smith PLC, WestRock Company, International Paper Company, Smurfit Kappa Group Plc.